Our group at the beginning of all the different waterfalls here at the park ! This is what greets you at the end of the trail. Words cannot describe how incredible this is. I forget the name of this animal, but it stole Taylors cheeseburger right off of her plate while she was sitting down and praying for the food ! They gave her another cheeseburger by the way. Today was a great day to just relax, and to stand in awe of God’s creation! 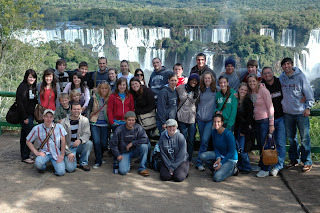 The team got to spend time at the park where all the falls are, and then we went to another little park where all three countries meet together (Paraguay, Argentina, and Brazil). Later in the day we went to Tim’s house for their Sunday service (Brazilians have church on Sunday night, and not in the morning). It was a great time to fellowship with the believers there, they really have an awesome church ! We also had a great time at the church retreat yesterday (although it was a little cold). It didn’t rain, so that was a blessing. We got to worship together, study the Word together, eat together, and of course play soccer together……which I may add that our American team beat the Brazilian team 3 to 2, thanks to an own goal on them in the first minute, and Brain being on fire in goal! Of course I understand it was pure luck. Please pray for us tomorrow as we go to our last English School in the afternoon. Pray for open doors to be able to share about our relationship with Christ, and how He has changed our lives, and can do the same for them. We all really appreciate your prayers. We know the Lord has been so faithful to answer them. Ok, I’m going to bed now, many blessings to you guys. A small of group of us went out on the streets this morning to pass out tracts and talk with the people of Foz. It was a very fruitful outing with lives turning to Christ, and others wanting to know more about the church here. In the afternoon the entire team went to a school to minister to kids from kindergarten to third grade. We broke up into three groups and went into six different classrooms for about 15 minutes each. The three groups were broken into Portuguese music, dramas, and English music. They all ended in a presentation of the gospel, and God’s love for them made manifest by the cross of Christ. The kids were so cute, and absolutely melted all of us. Hannah, and Bethany showing the kids the “sin chair” skit. Later on when Mike asked these kindergarten kids if they new what “sin” meant, one little boy proudly proclaimed “It’s what’s on the novellas (soap opera’s).” I would agree with that answer ! These are some of the kids that we got to spend the afternoon loving up! They were about to do a little performance in honor of their first day of winter (that’s why they have hats and gloves and all that stuff). I felt a little out of place with my rainbows, and a t-shirt on. Tomorrow we will be in the outskirts of town where we will have the church retreat. Please pray that the Lord would encourage the church, and that we would have good weather (it rained today). I’ll update some more tomorrow night, or Sunday Lord willing. Our team this morning as we left beautiful Campo Mourao, and made our way to Foz do Iguazu. Pastor Tim Rogers as he introduces our team from Philly to the rest of the congregation gathered for their mid-week study. Hello everyone, I apologize for not updating sooner, but the internet went down the last two days that we were at the Bible College, and today we spent the day traveling to Foz so it’s been a little busy. Everything is going really well – the Lord really blessed our last couple of days in Campo, and now we are excited to be here at Foz do Iguazu to help out Tim Rogers, and the Calvary here in Foz. Tonight we had a chance to spend time with the church for their mid-week study. 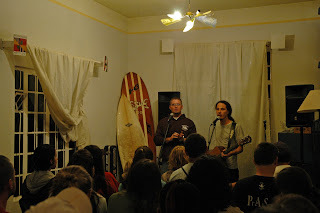 We worshiped in Portuguese, and then Brian shared the Word – it was a powerful exhortation, and we were all blessed! I want to let you guys know some of the things that we are going to be doing the next couple of days, so that you can continue to be praying for us. Tomorrow morning we will split up into three different groups. Some will be going to a boys prison to share the gospel and some music with them, others will go out on the streets witnessing, and passing out tracts, and others will be going to a special needs school to love on the kids there. In the afternoon, we will all be going to a kids school, where we will be doing skits, puppets, crafts, and of course sharing the gospel with them ! Tomorrow night we will be on the streets again witnessing, and sharing with the people of Foz. Saturday will be the day that we have the “Church Retreat” with Calvary Foz. We are going out into the countryside where are team will get a chance to fellowship with the church here. We will have a couple times of teaching, worship and prayer as well as a time to fellowship witht he church….in the form of a soccer game, and grilled meats ! Please pray that this day will be a blessing both to the church here and to our kids. Everyone is doing great. Please continue to pray for an outpouring of the Holy Spirit in our lives, as well as on the city of Foz. We recognize how the Lord has been faithful to answer your prayer, and we ask that you continue to labor in prayer for us in the second leg of our trip. Thanks. “The band” playing some music at the first school yesterday morning. There was easily 250-300 people packed in the gym in the morning. This is at the same school but in the afternoon. It was a totally new set of kids – they were a little younger then those who were there in the morning. Dimas (one of our translators who came with us from Philly) saying something funny……. I don’t have a lot of time to write now, but I do want to let you all know that the last day and a half have been incredible ! The outreach to the English schools, the boys prison, and the college have been the most fruit that I have seen on a missions trip in a long time ! So many kids, and teenagers have given their lives to the Lord, that in all honesty I can’t even give you a number – it’s definitely in the hundreds ! The music has been great, and the kids especially liked it when we taught them some of the English songs. The kids have been sharing their testimonies at each outreach, and the Lord has used them in great ways. The skits, and drama presentations have been excellent, and many people have responded to the gospel as it has been given out at the end. 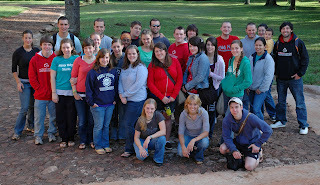 I’ll put up some more pictures of the “youth outreach” later on tonight when we get back. The boys prision was great, but we were not allowed to take in our camera’s so sorry, but I don’t have any pictures of that. Please pray for the youth outreach tonight. It will start around 7:00 U.S. time. We have been inviting people to come to this event since we first got here, and we are praying that many will come out tonight to hear the Good News about our King. Please pray that many would come to know Him as their Lord, and Saviour, and that they would get plugged in to the Calvary that meets there each week. God’s has been blessing so much, and we covet your prayers for tonight. Thanks in advance for laboring in prayer with us this evening. Everyone is doing great and we are all getting fat from too much incredible Brazilian food. At each meal, everyone says “this is the best thing ever. why don’t we have this at home” ! Anyway, thanks for lifting us up, and I’ll update soon. The local soccer team from the village by the the Bible College…..some of us played with them ! Tonight we ended everything at “Pizza Brazil” a local all you can eat pizza place. The chocolate and banana were my favorite! Mike Focht sharing with our kids and also the church here in Campo tonight. We met outside in a little square close to the center of town. People walking by stopped, and we were able to share with them. People got saved both last night and tonight as we went around and shared the gospel. Please pray that these guys and girls would get plugged in to the Calvary here in Campo that meets in the town. Everyone is doing well, and we are asking that you guys would pray for us tomorrow (Monday). We have a very busy day, as we will be sharing music, testimonies, drama’s, and the gospel at three different schools, one college, and a local juvenile boys prison starting at 9:45 tomorrow morning. Our last school will be at 9:00 at night so please pray for the Lord’s strength, and endurance as we minister the entire day. Please pray that many will come to know the Lord tomorrow as they hear of the Good News, and as they hear testimonies from our kids that love Him with all their hearts. I will take pictures throughout the day tomorrow, and hopefully will be able to post some video of what took place throughout the day as well. Thanks for your prayers, and please continue to lift us up before our Father, we indeed covet your prayers! Mike trying his hardest to keep the Brazilians from scoring on us ! The parachute was a huge success today – the kids loved this…………even the Brazilian kids ! Hannah painting a snake on the arm of one of the boys. The snake was the most popular animal for paining among the boys. I guess it’s the most masculine ? Hello everyone. We just got in from a full day of ministry here in Campo. We started the day off with breakfast, then we gathered together for a time of worship, and prayer, and time to sit before the Lord. We started the kids outreach around 1:00 and were there till 5:00. About 150 kids from the underprivileged community came out and we played soccer, baseball, and other games with them. We also had face painting, crafts, and nail polish for the girls. We ended the day with the puppet skit, a drama, some kids songs, and of course the gospel. We held the event in a facility where they have a bi-weekly Bible study and outreach for the neighborhood kids, so we are praying that this event will help these kids to get plugged in to the ongoing ministry that is currently being held there. After dinner we went out into the town of Campo, and walked around passing tracts, and talking with teenagers. People got saved, and we invited many out to some more events that we are holding in town later in the week. Please continue to pray for our team, and for the time we have with the church tomorrow (Calvary Campo). We are running the service, and then will hang out with the church throughout the day getting to know them a little more…..and getting killed by them as we play a game of soccer ! Later tomorrow night, we’ll go back into town to hold another outreach. Everyone is doing great, and we are excited to see what the Lord is going to do throughout our time here in Campo…..He has already done so much. This was our first full day here in Campo, and it was such a blessing. I will try to update this site in a day of two with more pictures, and some video if I can pull it off. Hey everyone, this is just a quick note to let everyone know that we made it to our final destination in Campo this evening around 4:00 p.m. We are currently one hour ahead of Eastern Standard Time. Everyone is doing great (although a little tired), and we are planning on meeting later tonight for some worship and prayer, and a chance to once again set all of our plans before the Lord, and ask for Him to take control and to bless. I will try to update tomorrow with some pictures of a kids outreach that we are going to be doing starting at around 1:00 p.m. here in Campo. Thanks for your prayers, and I will update some more when I am a little more together ! above – Pastor Joe praying for our team before we leave. Well, the time has indeed come for us to leave. 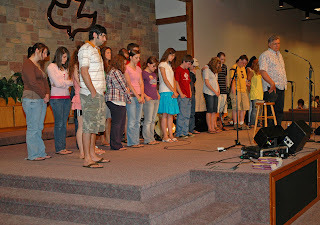 Lots of preperation and prayer have been put in over the last couple of weeks, and our departure is rapidly approaching. There will be an insert in our bulletin this Sunday with a prayer guide so that the congregation can pray for us each day, and for the specific ministries that we will be involved in. I figured I would post it up here as well. I will aslo be posting pictures and having some of the kids write on the blog during our trip, so please continue to check this site during the next two weeks. Free Day. 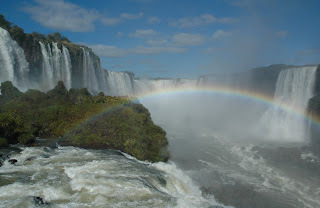 See Iguazu Falls and prep for return journey. Evening: Depart Foz to Sao Paulo. • The edification of the churches in Campo & Foz, and the unity, health, and saftey of our group.